Legal luminary, Chief Wole Olanipekun (SAN), has suggested that for government to fight and nip corruption in the bud or reduce it to a minimal level in Nigeria, its citizens must be given free education at all levels and also strive to provide employment opportunities for the youth. Olanipekun, made the remarks in an address he presented on the occasion of the 21st edition of the “Wole Olanipekun Scholarship Award”, at “Iyaniwura House, Moshood road, Ikere-Ekiti, Ekiti State yesterday. The 2017 scholarship awards which comes in different category is from secondary to university levels, as over 100 awardees received their cheques, including special awardees and law school students. The beneficiaries cut across local governments, states, religion and geographical zones, as many numbering over 200 have graduated from the scheme. He said rather than sloganeering and offering rhetoric of fight against corruption, what we should do is to be introspective and retrospective and provide means for all our teeming youths to enjoy free education from primary school to university level. The Senior Advocate of Nigeria, pointed out that the youth of Nigeria are despondent, they have no hope in today and government at all levels are not making efforts to provide assurances for them for tomorrow. He added: the few who have acquired university and higher degrees are jobless, PhD holders apply for jobs which attract less than N50,000 salary per month and yet, they don’t succeed. He challenge all wealthy Nigerians within and outside the country to have a re-think about our attitude to life and humanity, as well as our approach to the orchestrated fight against corruption by looking inwards as well as backward to lend a helping hand to the less privileged ones in the society, especially those who are brilliant but indigent by assisting them to acquire education. Olanipekun posited that what Nigeria needs today are not preachers but practical and honest men and women whose motto is not “do as I say” but “do as I do”, saying we need missionaries rather than gospellers. He advised leaders at the state and federal levels of government to provide the basic needs for the people as stated in the constitution, which citizens of all civilized and democratic climes in the world don’t take for granted. 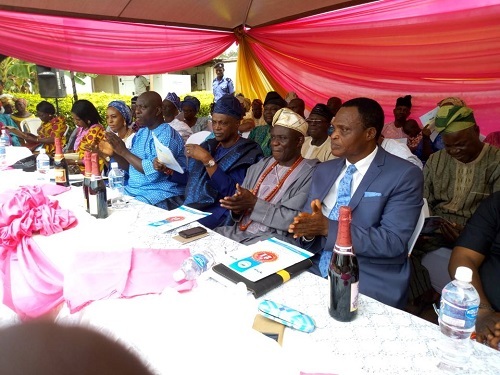 Earlier, the chairman, Board of Trustee, Chief Wole Olanipekun Scholarship Scheme, Mr. S.S. Omoyeni, said about two hundred students have so far enjoyed the scholarship in eleven public schools in Ikere-Ekiti. Omoyeni added that the awards covers 16 local governments of the state, 47 students for the 2017 awards are from Ikere-Ekiti, while 24 students are from other local governments of the state while many of them have graduated from the scheme.